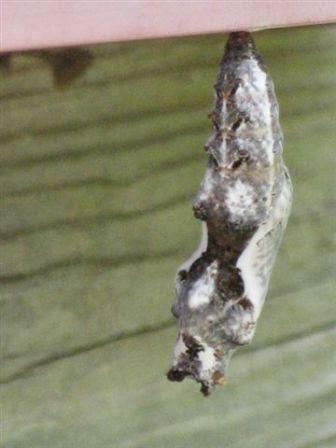 The chrysalis is approximately 2 inches long; mottled brown and looks like a dry leaf. LARVA: grows to approximately 3 inches in length and is bright orange and covered in rows of black spines on its head and back. The spines are soft to the touch and do not sting. The larva are poisonous if eaten. 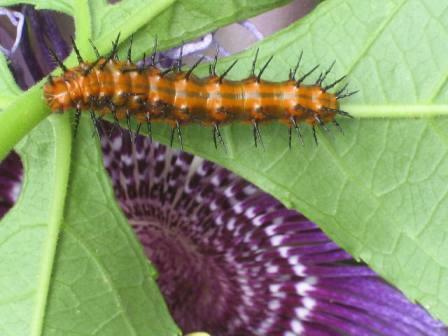 Their toxic flesh provides gulf fritillary caterpillars with excellent protection from predators. Birds avoid them. 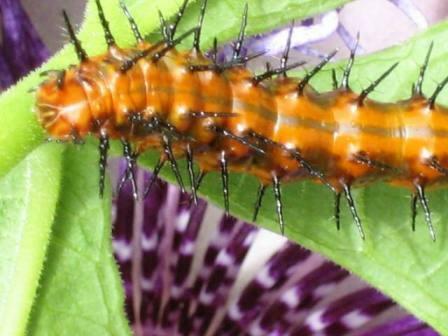 The larva feed exclusively on various species of passionflower such as maypop (Passiflora incarnata), the yellow passionflower (P. lutea) and running pop (P. foetida). DESCRIPTION: striking, bright orange butterfly of the family Nymphalidae. Medium to large butterfly. 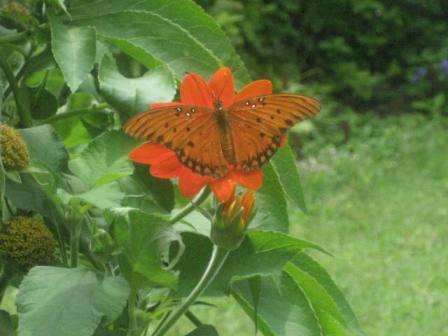 HABIT: The Gulf Fritillary is commonly seen in parks and gardens, and in open country. Range extends from Argentina through Central America Mexico, and the West Indies to the southern United States, as far north as the San Francisco Bay Area on the west coast. occasionally found further north in the US.